"He was assayer and metallurgist, and the gold bug had bitten him deeply" Errol Coote, Hell's Airport. 28. 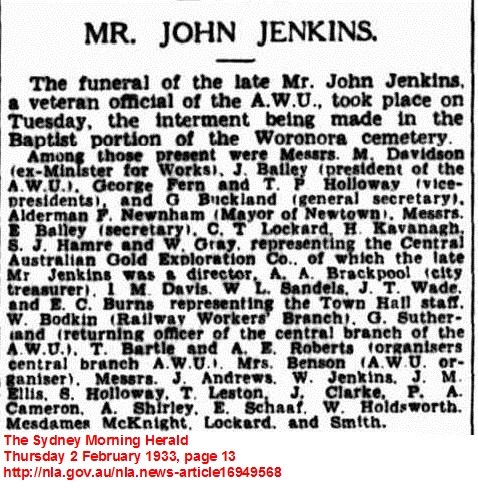 Mentioned several times in Hell's Airport and according to John Bailey, Jenkins was the Mining Secretary of the New South Wales Branch of the Australian Workers Union. He was in Bailey's office, along with Coote and Ernest Bailey when Lasseter told his story about a gold reef in central Australia that he had discovered in the late 1890s. Coote writes that it was Jenkins who calculated the value of the reef, "If she runs for ten miles, is twelve feet wide, and averages three ounces to the ton, down to a hundred feet, we could write our cheques for millions at a time. She would produce over two hundred millions of gold !". In his younger days he had been a gold miner working the West Australian goldfields with Herbert Hoover, it's quite amazing the number of Australian prospectors who have been associated with Hoover. And he too had seen the Aboriginals bring in rich gold specimens from the desert. He asked Lasseter what type of rock carried the gold, the reply was a greenish milky quartz, oddly similar to the bottle green quartz studded with gold that Basedow recalled came from Earle's Find. Jenkins was a shareholder and early Director of the Company and presumably had a hand in organising the Expedition, perhaps supplies and medicines. Late in 1932 Jenkins chanced his arm gold mining at Kurnalpi, where he contacted phthisis and died the following year. Some might attribute his untimely death to Lasseter's curse, made on page 28 of his diary while holed up in the cave on the Hull River, marooned by the Company and blinded by sandy blight, "I leave my everlasting curse on Blakely & Jenkins. Blakely for not sending the relief as promised and Jenkins for omitting the Argerol". Argyrol is a silver nitrate solution and a recommended treatment for sandy blight. Lasseter was not mollified by page 69, "I find it hard to forgive Jack Jenkins for his wilful neglect there, I put it in writing & urged upon him the necessity of including an ounce or two in the medicine chest". Errol Coote, Hell's Airport. Preface, 27-32. Lasseter's Diary. 28,69. John Bailey, History of Lasseter's Reef.